“After careful consideration The Duke of Edinburgh has taken the decision to voluntarily surrender his driving licence,” the palace said in a statement. UK police sent their investigation of the crash to the Crown Prosecution Service (CPS), which is considering whether to bring charges against Prince Philip over the crash last month. A CPS spokesman said they would “review each file carefully before a decision is made” and will take into account that Philip surrendered his license. The prince later apologized to Emma Fairweather, who suffered a broken arm in the collision, blaming the crash on sunlight that obscured his view and admitting he was “shaken” by the incident. “I would like you to know how very sorry I am for my part in the accident,” Philip wrote in the letter, which was obtained by the UK’s Sunday Mirror newspaper. A Buckingham Palace spokesperson confirmed to CNN that the letter was sent by Philip. “I have been across that crossing any number of times and I know very well the amount of traffic that uses that main road,” the Duke of Edinburgh wrote, blaming the incident on bright sunlight. The accident left the Duke’s car flipped onto its side, with a witness later telling the Press Association that he helped pull a bloodied Philip from the vehicle. Fairweather also told the Mirror on Saturday that she welcomed Philip’s decision to surrender his driver’s license. The incident dominated British media and led to a public debate about whether people over a certain age should have to retake their driving tests. 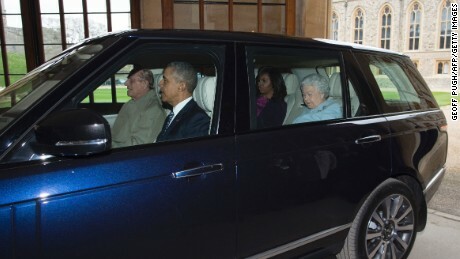 Prince Philip famously drove US President Barack Obama and first lady Michelle Obama from their helicopter on a visit to the United Kingdom in 2016, with the Queen in the back seat. CNN’s Max Foster and Bharati Naik contributed to this report.